Kalo jam/ kala jamun is a unique Bangladesh Sweet. It has similar taste like lalmohon/ golap jamun. 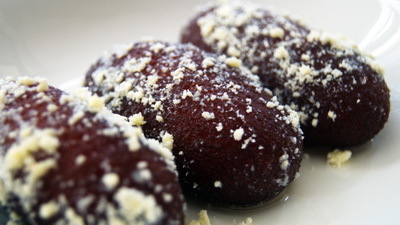 But kalo jam / kala jamun has darkened texture because of using sugar and more firm. I tried to simplify the process of making kalojam / kala jamun. To me making any sweet is easy if you can keep or maintain temperature, using a range cooker can help you to achieve this easily. So temperature needs to be medium and it needs to be slow fry. If you fry it on high heat, its outside will be cooked; inside will be raw which will make hard sweet. 1. First put a sauce pan on heat with 4 cups water, sugar and mace. When sugar is melt and syrup comes into boiling point boiling point, turn off the heat. Keep aside. We need lukewarm syrup to soak the sweet. 2. Mix milk powder, self raising flour, semolina, nutmeg, sugar and cream. Add thicken cream little by little and crumble it up. Don’t make it soft. It will nt be like dough. It will be like crumbly cheese (chana). 3. Divide the dough into 16-18 balls and make each into cylinder shape. 4. Heat the pan on medium with oil for deep fry. When I say deep fry that it means enough oil to deep the sweet while frying. Check the oil to put a little piece of dough in the oil if it sizzles and comes up slowly .It means the oil is ready. 5. When oil is ready (don’t make oil too hot, we will slow fry them), put the sweet in the oil with care and fry it all side till it becomes dark brown. 7. Soak sweet at least ½ hr. Take out the sweets from syrup and roll in mawa. 8. Serve kalo jam / kala jamun chilled. 1. If the dough becomes soft add milk powder and self raising flour 4:1 ration. Such add 1/2 tsp flour and 2 tsp milk powder. on the other hand for hard dough add cream. Is there a telepathic communication, I wonder coz only last night my Filipino friend Madelein asked d recipe for Kalojam which she had tasted at my tea party in Japan. We enjoyed beef bhuna and nun with kalojam and bangladeshi tea. She never forgets the taste of Bengali cuisine and repeatedly asked for d recipes. As in d last night she asked to share kalojam but I gave Rasmalai- could not find kalojam. She also searched…and this morning interestingly we found kalojam! Don’t u call it telepathy? Thanks for d recipe. I love to have telepathic communication with my readers. It will my pleasure to maintain this communication. Thanks. Please inform me what is self raising flour? Self raising flour is ready made flour with baking powder. You can find it in flour section in any super market. 1 cup plain flour, 1 and 1/4 teaspoons baking powder and 1/4 salt need to make self raising flour. But I always use ready made one. Thanks. can you please tell what is mace? And when to put the color? Mace is joytri. you can find in Indian grocery. Color is optional .. put it when you are mixing dry ingredients. Thanks. hi,Rownak.what is thicken cream?can I use milk? I never use milk but I think that it is possible to use milk. need to use less amount milk and thicken cream give it better taste. Thanks. Thanks.u don’t tell me what is thicken cream. 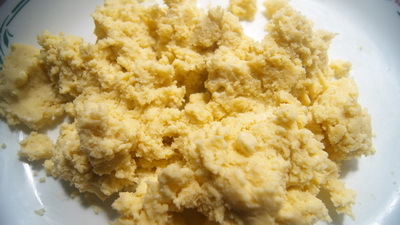 thicken cream is one kind of cream which is used for whipped cream. It is available in every supermarket. Though I am not very sure about Bangladesh. Hi Rawnak, is it must to use mace and nutmeg powder? what are their function? If I don’t use these will it taste different. Please let me know. Thanks.Also recipes works well for me but the rosogolla I failed to make several times. Don’t know why. P.s. making rosogolla today. If you can come my house, I will show you from begin to end. Hi Rawnak, Thanks for your comment. May try rosogolla in near future but can’t fly to brisbane from perth now though I wish if I could. Hi ,I wish I could fly and learn all the misti from you.Feel like eating your kalojam.I have never tried kalojam before.but your recipe seems to me easy.when read or see any misti it seems very easy but it needs practice and some tricks. Hi rawnak, what is plain flour. Honey plain flour means usual flour(moida). Reasons behind hard sweet are mostly cooking temperature and dense of the dough. dough needs to be soft dough and temperature should medium heat. why are you worried about flour? have you used self raising flour? Hi.. i love your recipes. I wanted to know if you need to put the heat on for syrup when soaking thesweets for half an hour. Thanks. Please keep sharing your wonderful recipes. you dont need to heat the syrup but syrup needs to be lukewarm when you are add hot kalo jam in it. Thanks. thanks to Allah. I am very happy to your success. Hi rownak! I’ve pretty much all the ingredients to make it. But you never mentioned when to use mace. Could you edit the recipe or just reply here? Ive made lal mohon last week. It was so rich in taste. It was an absolute easy recipe. Everyone loved it. Thank you! Thanks A lot. I used mace in syrup. It is literally in first line. Somehow you missed it. Lal mohon and kalo jam are pretty same kind of recipe with bit of twist. When I started my journey to make Sweets , lal mohon was my venture. Happy to hear that you liked it. If the dough becomes soft add milk powder and self raising flour 4:1 ration. Such add 1/2 tsp flour and 2 tsp milk powder. on the other hand for hard dough add cream. Thanks and most welcome. I am not sure can I use 3/4 cup semolina or 3table spoon semolina . Please tell me. 3/4 cup semolina which will gives crumbly inside texture like chhana. You use less or skip it if you want. Then you need increase milk powder which will more smooth texture inside.main point milk powder and semolina will be 2 cups together. Thanks. how r u ? i like ur recipe very much.its clear and easy to understand . i will try it at my home . thanks a lot . please keep in touch. I am fine, thanks. Hope you are going good too. Love to keep in touch. After frying , it was light brown in color…in the picture it is shown dark black color? How can I get this? Another thing, it is very soft after frying and after taken from syrup… How can I make it little bit more harder? Thank you. if you add bit sugar in dough, you get darker colour.fry till it gets bit dark and if you want more firmer use bit more semolina. Thanks. Salam. I like your recipes. I am a simple family guy live simply in New York City. When you come to New York come and visit us. Thanks. Thanks for invitation Siraj Ud Doulah. Nowadays hard to find simple person, love to meet your family . Thanks for the recipes, 1st time i made kalojam, my hubby and my daughter loves it..when i made for dawat or i made for gift, all peoples loves it . Thank you very much Rownak. I am indonesian but my husband bangladeshi, so i learn all ur recipes. Alhamdulillah never failed, cz ur recipes very easy to follow.